This is my recent spinning…. This past weekend the Salt Spring Weavers and Spinners Guild had their annual sale and I had a SAORI weaving workshop in Victoria. 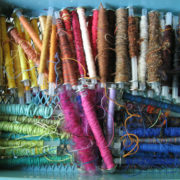 This week I have two classes coming up, plus some weaving and spinning to work on myself. I’ll do another post with things I work on during the week. What are you spinning or weaving this week? Congrats on the first place ribbon, very pretty yarn. John just finished 2 piano scarves and I am getting some new warps ready for the mohair yarn. I just finished spinning some purple/lavender/blue wool/llama/mohair singles. It’s hanging to dry right now. Once it’s dry I’ll weave a shawl out of it on my triangle loom. My boyfriend made the loom for me. This will be my first project on it.